Preparing the cornhusks. Cover the husks with very hot water, weight with a plate to keep them submerged, and let stand for a couple of hours until the husks are pliable. For forming the tamales, separate out 24 of the largest and most pliable husks—ones that are at least 6 inches across on the wider end and 6 or 7 inches long. If you can’t find enough good ones, overlap some of the large ones to give wide, sturdy surfaces to spread the batter on. Pat the chosen husks dry with a towel. Preparing the batter. With an electric mixer on medium-high speed, beat the butter, lard and/or shortening with the sugar, 1/2 teaspoon salt and the baking powder until light and fluffy in texture, about 3 minutes. Continue beating as you add the masa (fresh or reconstituted) in three additions. Reduce the speed to medium-low and add the milk. Continue beating for another minute or so, until a 1/2 teaspoon dollop of the batter floats in a cup of cold water (if it floats you can be sure the tamales will be tender and light). Beat in a little additional milk if needed to give the mixture the consistency of soft (not runny) cake batter; it should hold its shape in a spoon. For the lightest textured tamales, refrigerate the batter for an hour or so, then rebeat, adding enough additional water to bring the mixture to the soft consistency it had before. Setting up the steamer. 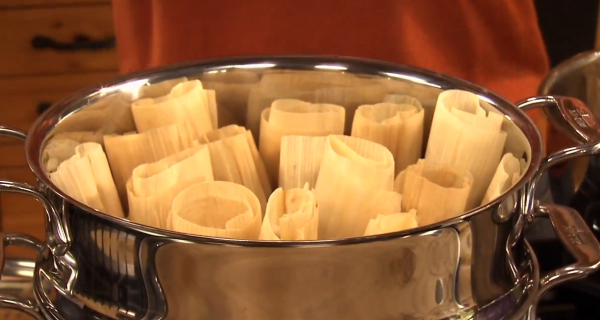 Steaming 24 husk-wrapped tamales can be done in batches in a collapsible vegetable steamer set into a large, deep saucepan. To steam them all at once, you need something like the kettle-size tamal steamers used in Mexico or Asian stack steamers, or you can improvise by setting a wire rack on 4 coffee or custard cups in a large kettle. It is best to line the rack or upper part of the steamer with leftover cornhusks to protect the tamales from direct contact with the steam and to add more flavor. Make sure to leave tiny spaces between the husks so condensing steam can drain off. Forming the tamales. Cut twenty-four 8 or 10-inch pieces of string or thin strips of cornhusks. One at a time, form the tamales: Lay out one of your chosen cornhusks with the tapering end toward you. Spread about 1/4 cup of the batter into a 4-inch square, leaving at least a 1 1/2-inch border on the side toward you and a 3/4-inch border along the other sides (with large husks, the borders will be much bigger). Place 2 pieces each of cream cheese and ate down the center of the batter. Pick up the two long sides of the cornhusk and bring them together (this will cause the batter to surround the cheese and ate). If the uncovered borders of the two long sides you’re holding are narrow, tuck one side under the other; if wide, then roll both sides in the same direction around the tamal. (If the husk is small, you may feel more comfortable wrapping the tamal in a second husk.) Finally, fold up the empty 1 1/2-inch section of the husk (to form a tightly closed “bottom,” leaving the top open), and secure it in place by loosely tying one of the strings or strips of husk around the tamal. As they’re made, stand the tamales on their folded bottoms in the prepared steamer. Don’t tie the tamales too tightly or pack them too closely in the steamer. They need room to expand. Steaming and serving the tamales. When all the tamales are in the steamer, cover them with a layer of leftover cornhusks; if your husk-wrapped tamales don’t take up the entire steamer, fill in the open spaces with loosely wadded aluminum foil (to keep the tamales from falling down). Set the lid in place and steam over a constant medium heat for about 1 1/4 hours. Watch carefully that all the water doesn’t boil away and, to keep the steam steady, pour boiling water into the pot when more is necessary. Tamales are done when the husk peels away from the masa easily. Let tamales stand in the steamer off the heat for a few minutes to firm up. For the best textured tamales, let them cool completely, then re-steam about 15 minutes to heat through. Working Ahead: Both filling and batter can be made several days ahead, as can the finished tamales; refrigerate, well cover. Re-steam (or even microwave) tamales before serving. For even more flexibility, batter, filling or finished tamales can be frozen. Defrost finished tamales in the refrigerator overnight before re-steaming. I just made them with ricotta cheese instead of cream cheese and omitted the sugar because we need to watch our extra calories. They are delicious!!! What is ate de guayaba & is it found in Mexican stores ? Thanks so much. It is found in Mexican Stores – it is a Guava Paste (that more resembles a gelatin) that is delicious. Definitely find it in Mexican markets. Below is a photo I found of the La Costena brand – but any brand would work. Used this recipe for my first foray into tamal-making. I didn’t have a tamal steamer, so I used my large 21-quart granite ware canner. I turned the jar rack upside-down and covered that with corn husks, creating a perfect tamal steamer. It held all 24 tamales with room to spare, which I just filled with some wadded aluminum foil. I had never had sweet tamales before. I found some quincy gel instead of guava at the Mexican grocery, and the tamales came out great. Will make this again, but next time I think I will use a jack cheese instead of cream cheese and slice the gel into strips instead of cubes for a more even distribution within the tamales. Thanks for the recipe. As always, it was a hit. OMG this recipe is so delicious. I made it today for Christmas Eve and it was a big hit. Everyone loved them. 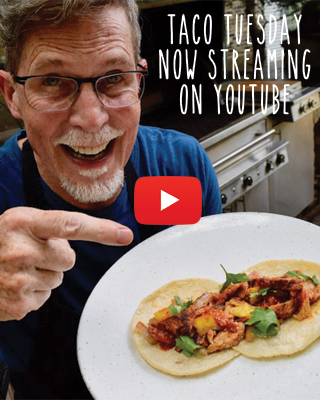 Thanks for your amazing tv show and delicious recipes. Señor Ricki me encanta su show, fabuloso y su hija futura chef. Espero algun dia ir a su restaurant en Chicago, pues vivo en Chicago. Dios los bendiga.